… And It’s Waving a Flag! I sincerely hope that no Trumpf supporters are reading my blog. First of all, I have nothing to say to them that would not be obscene. Secondly, however much they admire The Hat which they elected to the presidency, they must be apprehensive that he is continuing a long, spiraling descent into the pit.This has not been a great month for the Present Occupant of 1600 Pennsylvania, however much he dislikes the place for its lack of gold plumbing fixtures and other brothel trappings. 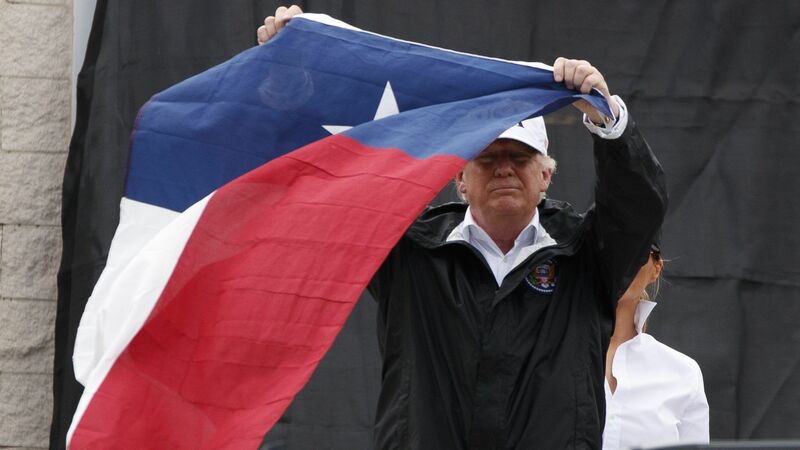 The pictures of Trumpf deplaning in Houston show Melania behind him wearing a hat that says FLOTUS. I thought for a second, “Is that some sort of sick joke or something?” And then I thought it was short for First Lady of the United States. One has to be a really astute leader of men to come out of a disaster like Hurricane Harvey or Hurricane Katrina with one’s reputation intact. And the two presidents in question were certainly not that.